The law office of Schmidt & Schmidt, S.C., located in Wausau, Wisconsin, has earned a reputation for integrity and trust among its many satisfied clients. The law firm's attorneys understand that seeing a lawyer can be intimidating, so they go out of their way to make each client feel comfortable and well cared for. By building personal relationships with clients, the firm's lawyers create bonds that often last for years. 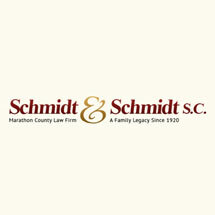 The attorneys at Schmidt & Schmidt take pride in their reputation for being down to earth, honest and straightforward. Real estate: Including buying or selling a home, boundary disputes, family cabin agreements, eminent domain issues, and commercial real estate transactions. Small-business planning: Including assistance in selecting the type of organizational entity under which to operate, preparation of agreements, sale and purchase of businesses and dissolution. Probate and estate planning: Including wills, living wills, trusts, guardianships, conservatorships, medical assistance planning, and advance directives for health care and finances. Divorce and family law: Including contested divorces, post-divorce litigation, premarital and post-marital agreements, child custody and stepparent adoption. Led by attorney Andrew Schmidt, the firm takes a common-sense approach to legal issues and is dedicated to high-quality legal services for reasonable fees. Schmidt & Schmidt accepts credit cards (Visa, Master Card and Discover) for your convenience.